I’m standing near the top of Mount Mansfield, Vermont’s highest mountain contemplating a descent down the world’s fastest and most exhilarating zip line experience. It’s around two miles to the bottom and, although I’m the timid type, Vermont is spurring me on to all sorts of outdoor craziness. Before I came here, my only acquaintance with the state had been “Moonlight in Vermont”, a 40’s show tune written by someone who never visited the state. I’d enjoyed the melody but never thought any more about it. Now I know that Vermont is part of the New England region, butting up against the Canadian border with Massachusetts to the south, New Hampshire to the east and New York to the west. 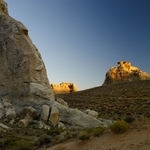 It’s the second least populous US state, after Wyoming, and is the USA’s largest producer of maple syrup. It’s full of forest, very green and a mountain range runs north-south up the middle, called, guess what, the Green Mountains. The population cares so much about the environment that they’ve banned advertising billboards and prohibit fast food chains. Of course, this makes Vermont perfect for outdoor activities. 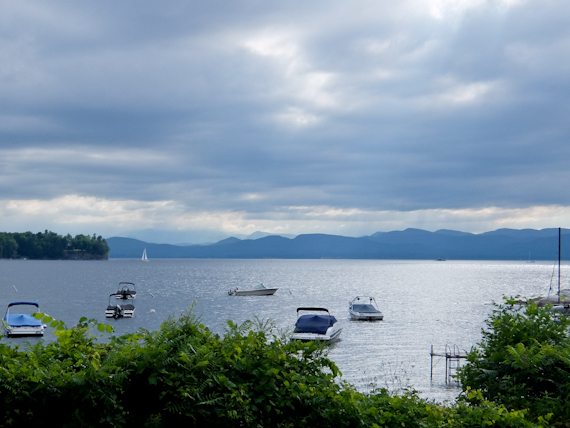 Burlington is Vermont’s largest city on the shores of Lake Champlain. At 120 miles long and 12 miles wide, Bill Clinton designated it one of the Great Lakes in 1998. Unfortunately, its status only lasted 18 days after one senator nicknamed it “Lake Plain Sham” and it was kicked out of the club. Nevertheless, a 90-minute cruise on the Spirit of Ethan Allen, circling some of the lake’s 70 islands, has glorious views of the Adirondacks, although the dreaded Champ, its equivalent of the Loch Ness Monster, doesn’t put in an appearance. Later I go on a bike tour, sampling craft beers and ciders from various microbreweries, and as I peddle back by the shore, I’m still on the lookout for the monster. Ben & Jerry’s started from an ice cream kiosk in a renovated gas station in Burlington but now has moved to Waterbury, around 25 miles east. 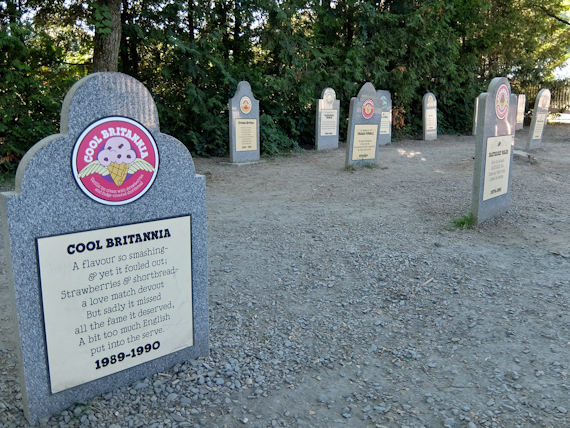 You can take a 30-minute factory tour but the highlight is their Flavor Graveyard where you pay your respects to the dearly departed. You can even vote to resurrect your favourite. From here, I drive to the far north of the state to Jay Peak Resort, nestling in the mountains a few miles from the Canadian border. 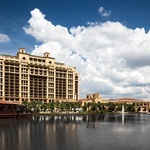 In the winter there’s glorious skiing here, but they’ve built a wonderful indoor water facility where you can practise your surf skills, go drifting down their lazy river or ride one of their water slides. For adrenalin junkies, then La Chute is a must. You climb up 20m to a platform and step into an enclosed tube where you cross your arms and legs. On a signal, you drop vertically at 45 mph, then you’re thrown upside down through a full 360 loop, before arriving at the bottom six seconds later. More relaxing is to go birding with Dr David Hof from New England Bird Tours. He’s an expert in differentiating between the various species and there’s a good chance of spotting Bald Eagles and Loons. 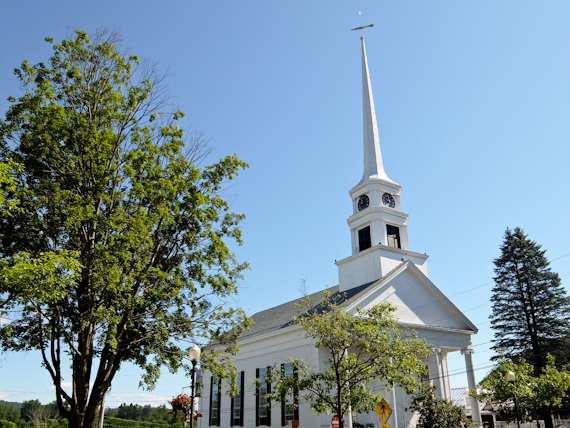 On my way back to Burlington I stop at Stowe, a quintessential New England town with clapboard houses and tall white church. You can start your morning walking or jogging their Recreation Path, a five and a half mile greenway, crisscrossing the West Branch of Little River, good exercise before breakfast. Stowe is a world-class mountain biking destination, with a large network of trails that are both fun and challenging, and cater for every ability. You can hire a bike, or take a tour with Ranch Camp following the Cady Hill Climb up steep paths through the forest to the Green Chair Overlook. I find negotiating the concealed tree roots particularly tricky and dismount and push for some of the way. 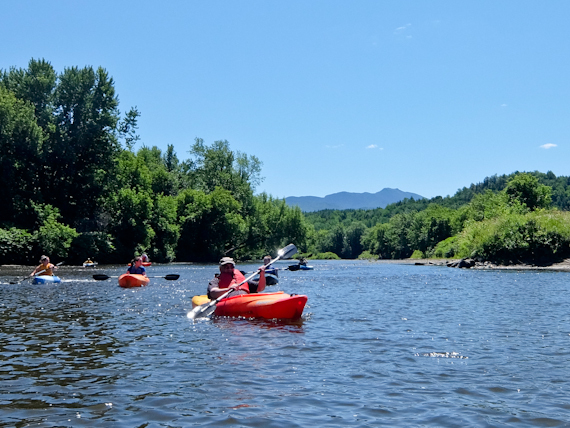 Nearby is the Lamoille River, the venue for guided kayak trips, paddling downstream for four miles. There’s no whitewater here and the greatest hazard is getting grounded in the shallows. 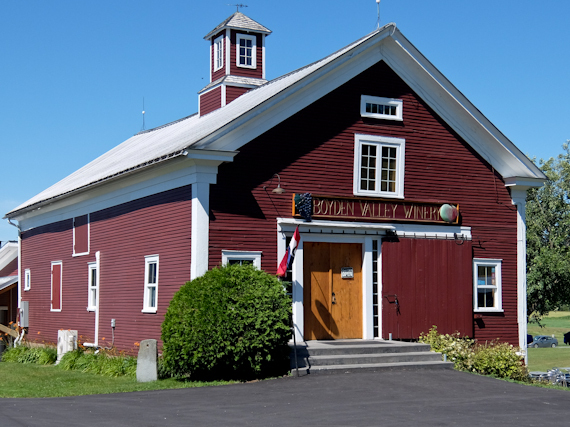 Best of all you end up at the Boyden Valley Winery for a tour and a tasting. Rather surprisingly, the family who’ve made the Stowe their adopted home are the von Trapps, of Sound of Music fame. After they escaped from Austria they embarked on a singing tour of the US and settled just outside town. Initially, they just gave music lessons but now have developed their own resort which includes a hotel, brewery and Austrian coffee house. And if you’ve missed the famous film, they’ll make sure you don’t miss out. 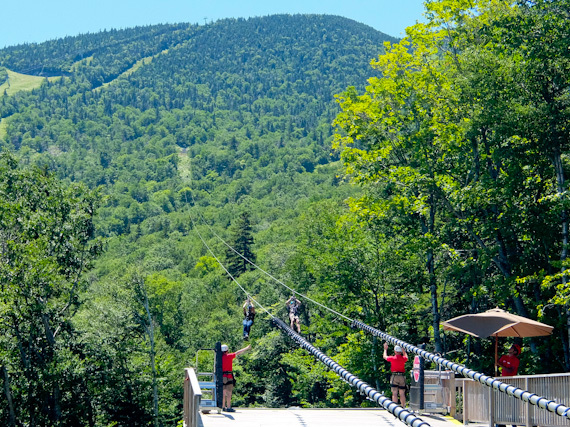 The Stowe Mountain Resort is a major attraction for skiers in the winter but, for the summer, they’ve developed their ZipTour Adventure, one of the longest and fastest zip lines in North America. After you’ve donned helmet and safety harness, you take the gondola up to near the top of Mount Mansfield at around 1300m. It’s then downhill all the way on zip lines in three stages for two miles, back to where you started. Each stage has two parallel lines so you can experience it all with a friend or companion. The first, the Nosedive Zip, is the third longest in the US at just under a mile and it seems to go on forever as you hurtle, 55m above the ground. You can reach speeds of up to 60mph but I’m so scared that I constantly press the brake, although that makes the ride last even longer. The second stage, the Haselton Zip, although shorter, runs high above the trees with stunning views of Smuggler’s Notch, a narrow pass through the Green Mountains. All you see are trees and sky until you dare to look down and see the resort far below. 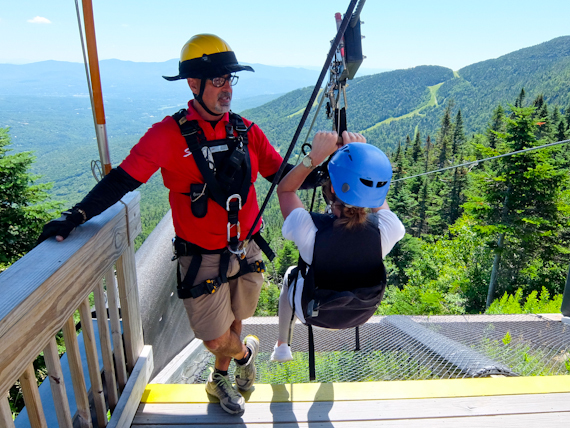 The final stage, the Perry Merrill Zip, actually flies into the forest, giving you an exhilarating sense of speed for a scary two-thirds of a mile, before ending close to the Gondola station at the bottom. I arrive, shaken and slightly stirred, even though I never believed I could do it – it seems that the Vermont brand of courage can certainly give the Dutch a run for their money. Vermont Vacation has information about the state. United flies to Burlington via Newark or Boston from London Heathrow. Hertz can arrange hire from Burlington Airport. The Sun and Ski Inn makes for a comfortable base in Stowe. Jay Peak Resort has hiking trails through the mountains and has a world class golf course. 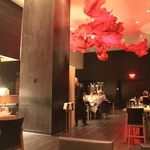 Hotel Vermont is a boutique hotel in downtown Burlington which offers free cycle hire.